Oh the irony. 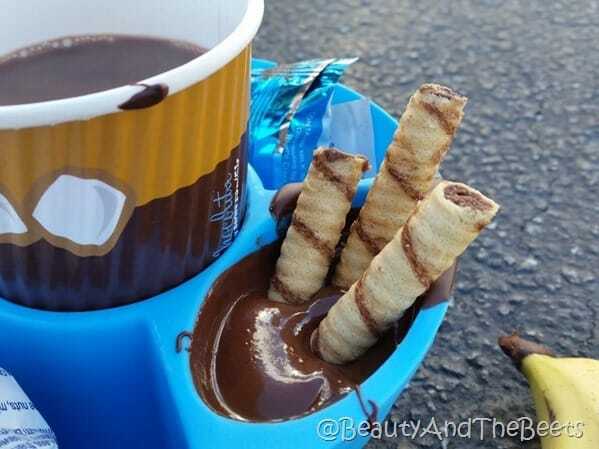 A Hot Chocolate race that almost got cancelled due to the cold weather. 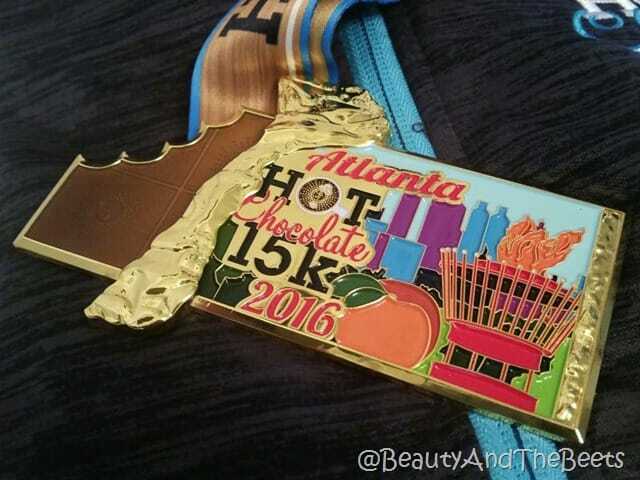 This past weekend Mr. Beet and I took a drive up to Georgia to run in the Hot Chocolate 15k Atlanta race. The forecast was cold, very frigid cold, too cold for any human to decide it’s a good idea to run even a mile outside, let alone 9.3 miles. 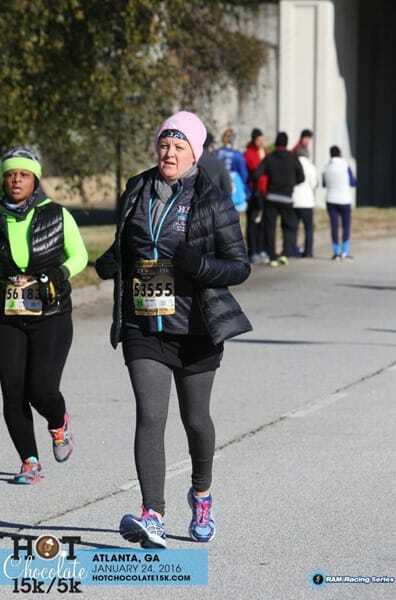 It was so cold that the event organizers were actually downgrading runners from the 15k to the 5k to limit exposure to the elements, a precaution for both the runners and the event volunteers. So cold that many thought the race should have just been cancelled. How cold, you ask? 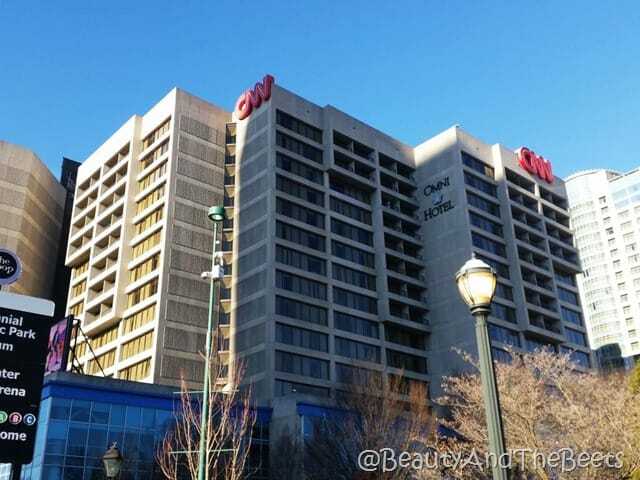 At the start of the race it was predicted to be 21° with a feels like temp of 15º. Now that is cold for Georgia and it is unbearable for this Floridian. It was snowing when we arrived into town, the roads were iced over and half the town was shut down the day before the race. We know because we tried to eat at a Vegan restaurant that was closed due to “inclement weather”. 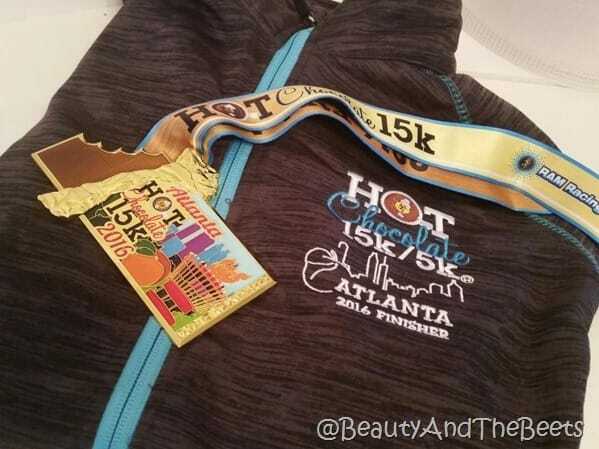 We did, however, make it to the race expo to pick up our bibs and grab a few chocolate treats before the race. Hot chocolate and chocolate-dipped marshmallows, was this a sign of things to come? Oh yes, my friend. 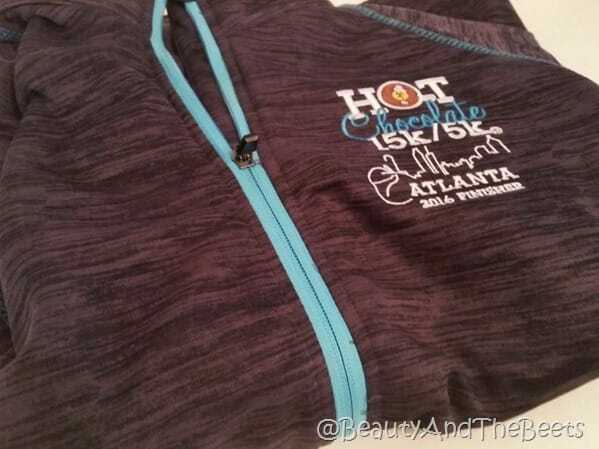 One very cool thing about the Hot Chocolate races is that they do not hand out t-shirts like other races, instead every racer is given a swanky embroidered jacket- and boy was it needed! The morning of the race, Mr. Beet and I drove to a MARTA station to catch the train to the race. It was freeeeezing. It was so cold that even in my 5 layers of clothing I could feel the chill in my bones. It was so cold that we decided to go back to the room and crawl under the blankets. As we turned to go, two ladies, also wearing bibs, talked us into staying. They said it would get warmer as the sun rose. Two things- they were liars (it never got warmer) and we are so grateful we ran into them and they talked us into doing the race. All I thought about was getting that mug of hot chocolate at the finish line. While the race was organized very well, there was a lot of confusion as to who was going to be allowed to finish the full 15k and who was going to be downgraded. While Mr. Beet didn’t have to worry about that (he is a much faster runner than I), I decided to plan finishing the full 9.3 miles and if they pulled me off the course, well, so be it. I was lucky and completed the full 15k. It was so cold (are you detecting a theme here??) that I never shed my five layers. I had two hats on, two pairs of mittens, a scarf, three pairs of leggings and five layers of t-shirts, sweatshirts and jackets. 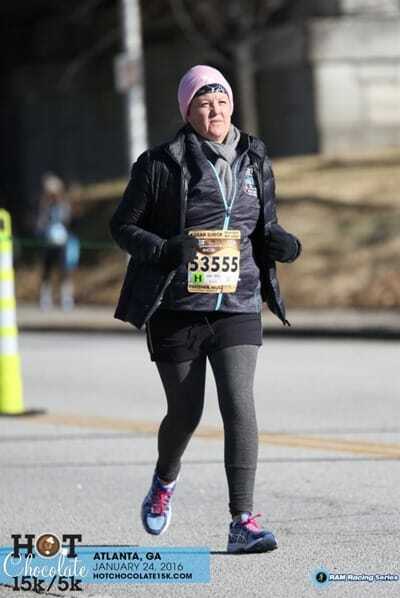 I was so bundled up it was hard to move, let alone run! The race itself was along a great course. 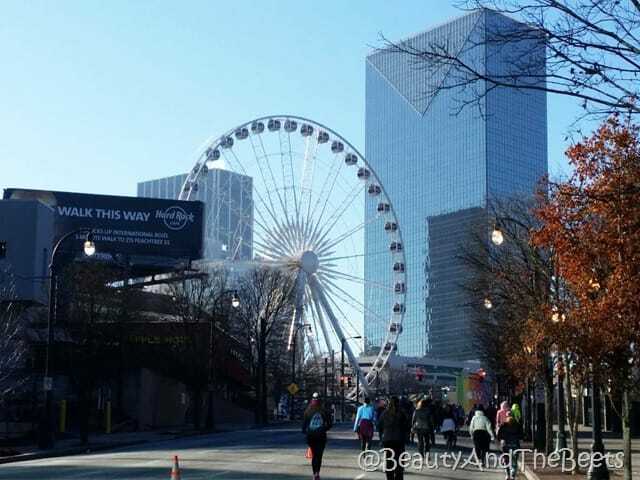 We ran through the campus of Georgia Tech, past the Skyview Wheel and the CNN Center, then finished at Turner Field. There were several sweet stations as well. 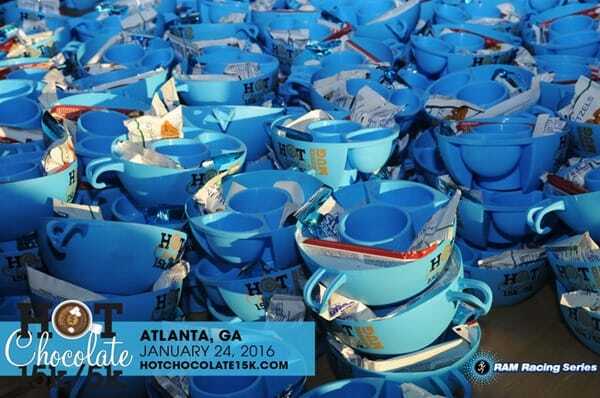 After all, the Hot Chocolate race series totes itself as the sweetest race in the world. I did not take any pictures of the treats along the race but I ate strawberry marshmallows, M&M’s, big chocolate chips and chocolate marshmallows during the run. Needless to say, there were 15,000 sugared up people running through the streets of Atlanta that morning! And at the finish, we got more treats. 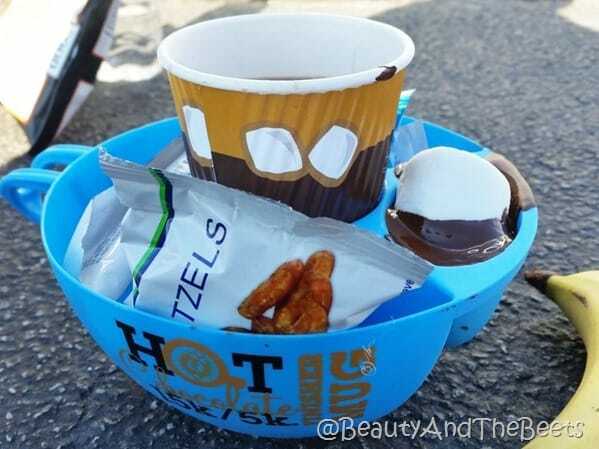 A very cool Hot Chocolate Event Finisher’s Mug. 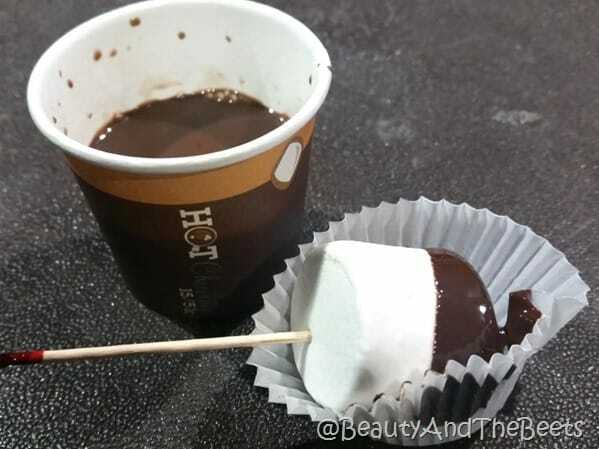 There was a much appreciated cup of hot chocolate along with some warm chocolate dipping sauce. And marshmallows, pretzels, cookies, rice krispies treats and a banana- all to dip into the chocolate. We really would have enjoyed the race a lot more if not for the cold. We were very happy to get on the train and go back to the hotel, where we spent the remainder of the afternoon under the warm blankets. However, I am so thankful for those ladies at the MARTA station who talked us into running. Now I have this cool half-eaten medal to brag about. 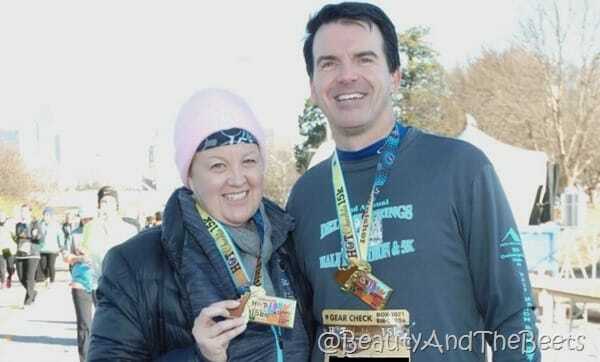 And sweet memories of the coldest race I have ever completed. I kind of wish it would have been- then we would have stayed warm!! !